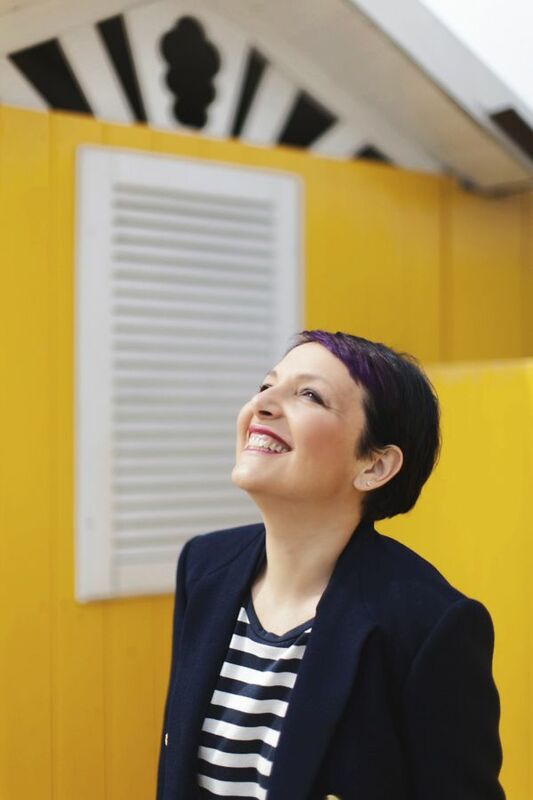 I decided to … straighten up and pretend to be a grown-up. I like to pretend to be a grown-up. Oh… are you saying that I’m already a grown up? At 47 years old, I probably am. But I have so much fun playing around with shapes and colours. And, believe me, it’s not about Peter Pan Syndrome… because getting old doesn’t scare me anyway. I’ve always believed that the passing of the years should actually be accompanied and supported. This may seem to contradict my obvious narcissism and misconceived need for exhibitionism. In reality, I really love to play around with fashion and, if you could imagine me in twenty years’ time, you’d see me with a beautiful turban, purple streaks in my hair and loads of colourful accessories. But, last Sunday, I wanted to try out being chic and so I used stripes. Partly because I love them in their every possible form. Horizontal, vertical, diagonal. I’ve often heard that they’re hard to use in combination, but this is not so. All you need to do is use a bit of thought. If you’re using them on the top half, it’s probably best to choose a plain coloured skirt or trousers, and vice versa. And it might be better to avoid dressing from head to toe in stripes if you want to avoid the prison inmate look. You say they make you look fatter? Actually, vertical stripes lengthen the figure and have a slimming effect, almost better than a diet! Evidently, if you have a large bust or a bit of a tummy, avoid choosing horizontal stripes in very bright colours, like orange and green, or yellow and red. Remember, thin stripes are very chic, whereas wide ones are more casual. 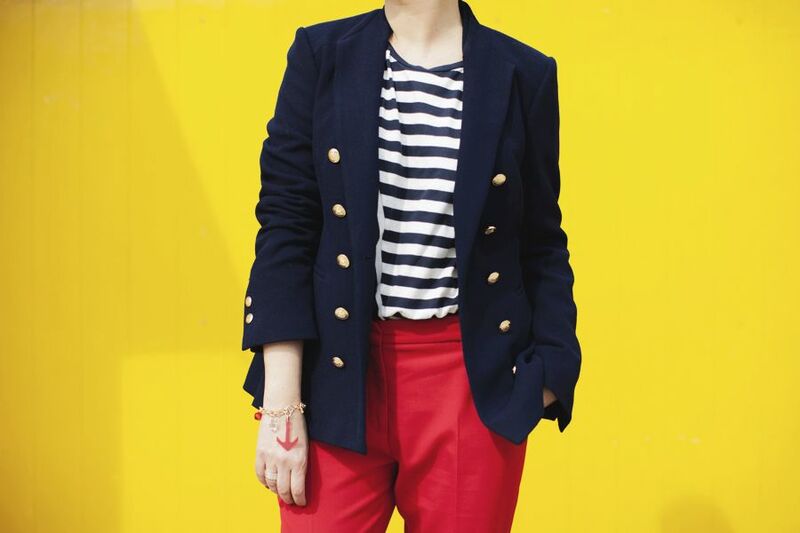 As far as I’m concerned, my favourite are navy stripes, which happen to have been in fashion since the 50s. In fact, stripes have reached trend icon status, thanks to the new generation of tattooed pin-ups who seem to be so cool these days. I also find that stripes immediately add both femininity and modernity to any look. 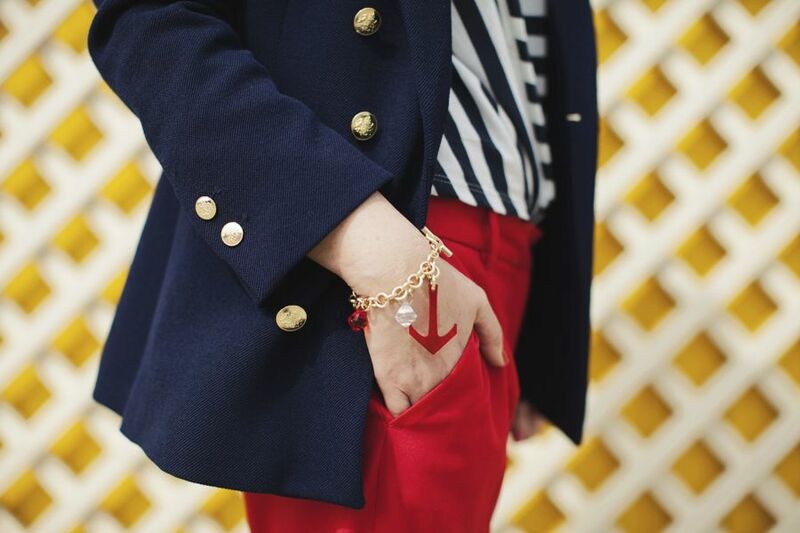 I chose to combine them with a blue jacket with gold buttons, to accentuate the navy mood, and to brighten up the whole outfit with a pair of red slacks. All from Zara. Vintage Chanel bag and playful themed accessory by Creattiva. 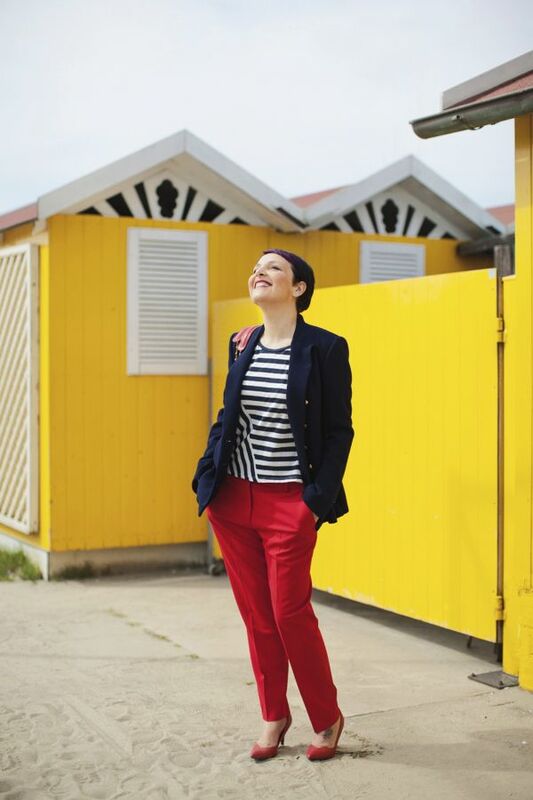 It was up to Giorgio to capture the look which, despite being of a ‘nautical’ nature, can also be worn in an urban setting. 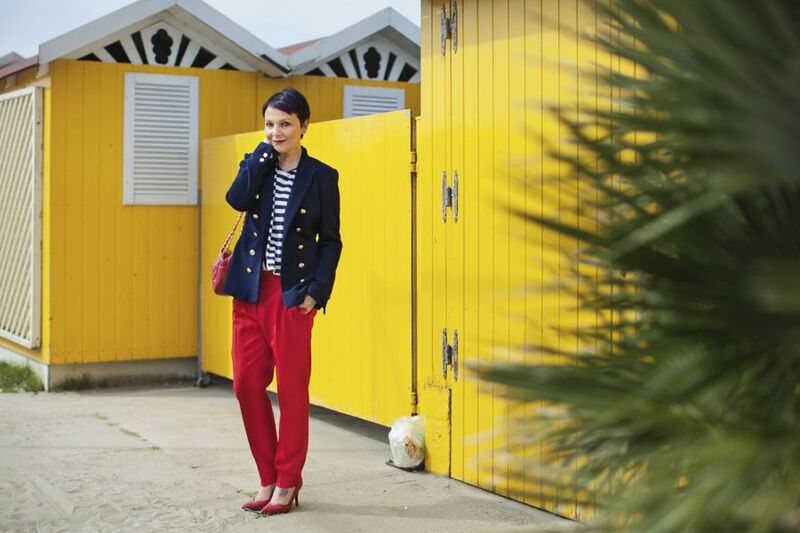 So it was decided to use not the beach – definitely too close to winter for that – but the beach huts, which happen to be a lovely bright yellow, in stark contrast with my outfit, thus creating the perfect backdrop with which to make the clothes stand out. A light-hearted background, yet, at the same time, geometrical and with well-defined shapes. For the full-length shots, we used a digital reflex camera with a fixed 50 mm lens; having chosen to use natural light, we used a very short f2.0 focal length and short exposure time, in order to detach the subject from its background. And so, here we are, at the end of the fourth article for this month. We are very happy to have been able to share our passions with you. Thank you for reading about us.